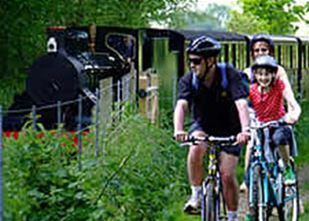 3 1/2 miles from Aylsham, Buxton is another halt on the Bure Valley Railway, a great place to stop off and explore. The village has a charming Medieval church just a short walk from the station. This is vibrant village and has retained it's local ameneties. It has a very good fish and chip shop (Closed on Mondays) A well stocked village shop and post office, open every day. 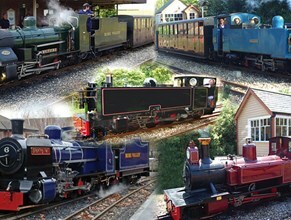 Many walks radiate from the station, including one from the station foot crossing to the hamlet of Oxnead with it's great Hall and Medieval Church. The hall is private, but was once home of the Paston family, famous for their illuminated Letters. 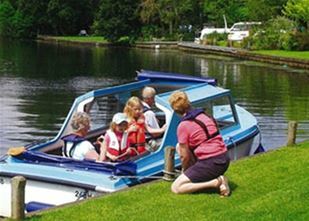 The short walk from Buxton to Oxnead, allows you to join the walk alongside the River Bure and view the great Oxnead Hall from the river and finally a short stroll from Brampton to Burgh Church and back to the station where you can flag down the next train to the next station - Brampton. Don't forget to take wellies or walking boots and a timetable with you. There is also an impressively restored water mill which can be easily seen from the path. The village’s main claim to fame is as the home village and burial place of Anna Sewell, author of Black Beauty. Anna's family also funded the village School which remains in use to this day. Buxton is also the birthplace of Thomas Cubitt (1788-1855) an architect who made his fame in London. His best-regarded development is Eaton Square, Belgravia. 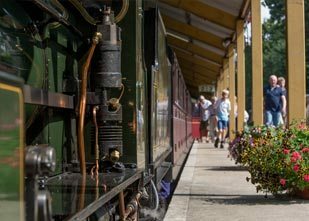 Having enjoyed a walk or explored the village, you can rejoin the train or walk alongside the railway or the river to the next station. To join the train at any intermediate station, just give a clear sign to the driver and he will acknowledge with a whistle! !